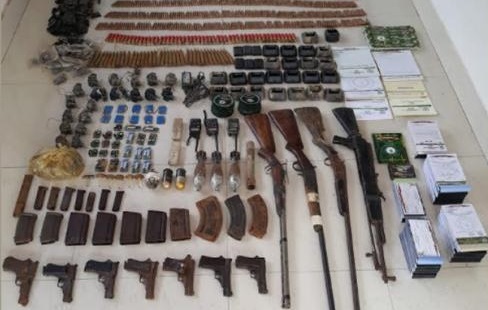 The Meghalaya Police on Wednesday seized a cache of arms allegedly belonging to the Garo National Liberation Army (GNLA) in a remote village of East Garo Hills district on following a tip off by a villager. A senior police official said that the arms recovered include an AK 47 with broken trigger assembly, one single barrel muzzle loading gun, two single barrel breach loading rifles, seven pistols, two AK magazines and one .303 LMG magazine and five self loading rifle magazines. Apart from arms, a cache of ammunition like two INSAS magazines, seven pistol magazines, three mortar shells, one 36 HE hand grenade, 2823 ammunition of various calibers, two remote controls for improvised explosive devices, 11 time bomb circuits, 12 RC bomb circuits, 10 time bomb batteries, besides three walkie-talkie sets, 34 WT battery chargers, 20 WT set adapters, six WT set battery covers were also recovered. The police also found 46 WT set headphones, four tactical pistol holster, one IED without detonator, and GNLA writing materials. Police are also looking out for more number of arms that may be hidden in the village. Earlier, the police also found a number of arms that have been allegedly stashed away by the commander-in-chief Sohan D Shira.